Do your kids like salad? Or do they eat it because you’re asking them to? I imagine there are some of both out there. In my house, salads have typically been rejected by my kids. Until I served this salad, and then everything changed. (At least for my ten-year-old—I’m still working on my eight-year-old.) 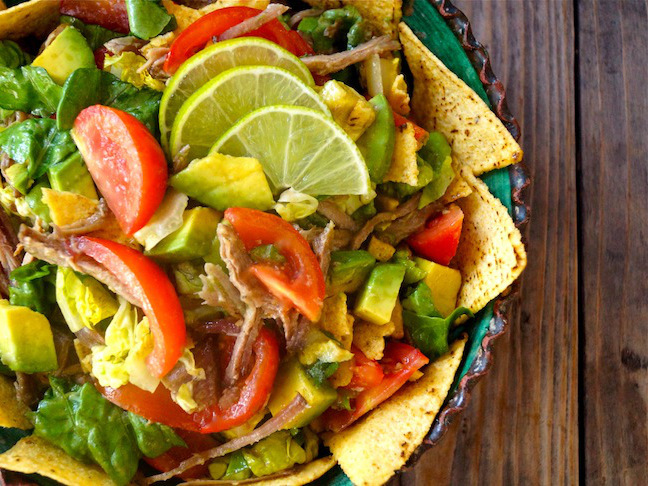 My ten-year-old loves this pulled pork taco salad so much that he’s actually been asking for salads at dinnertime. And trust me, it was no small feat getting here. I’m convinced it was the crunchy tortilla chips and the incredibly flavorful, succulent Perfect Pulled Pork. Step 1: To make the vinaigrette, add the lime juice, garlic, salt, and pepper to a small bowl. Then gradually whisk in the oil. Set aside. Step 2: In a large mixing or serving bowl, combine all of the ingredients except the chips. Step 3: Just before serving, toss with the chips and the vinaigrette.